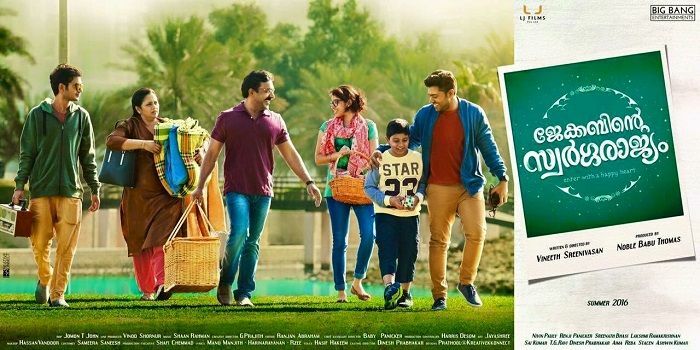 The official first look of young superstar Nivin Pauly's upcoming film Jacobinte Swargarajyam is out. The first look was released on 17 February by director Vineeth Sreenivasan and producer Noble Thomas, who announced the look on their respective Facebook pages. The Nivin-Vineeth combination has proved to be a hit with the Malayalam Box Office - their last films together, Malaarvadi Arts Club and Thattathin Marayathu were hits. The duo will aim to hit another hat-trick with their third film Jacobinte Swargarajyam. The film's producer Noble Thomas announced that the film chronicled the life of a family living in the UAE and is based on the relationships between youngsters and their parents living in the UAE. Over 80 per cent of the film was shot in Sharjah and Dubai. Jacobinte Swargarajyam will mark the debuts of a number of fresh faces - including Reba John of the Dhatri Oil advertisement fame, as well as Aima and Stacen. Someone to look out for is Ashwin Kumar, a Dubai resident who has a created waves across social media and has done a number of local performances for his mimicry videos. Kumar has also performed a Kamal Hassan tribute in front of the acting legend himself. According to reports, Ashwin Kumar's role was initially offered to Tamil director Gautam Menon. The film also stars Renji Panicker, Sai Kumar, Sreenath Bhasi, Dinesh Prabhakar and Lakshmy Ramakrishnan in strong supporting roles. Dinesh Prabhakar is also the casting director of the much anticipated film. Cinema lovers favourite comedy star Aju Varghese is debuting as an assistant director of the film. Shaan Rahman, who composed the Nivin-Vineeth duo's previous film's is composing the music of the film. Nivin Pauly who's riding high with this year's hit Action Hero Biju will be looking for his second hit of the year with Jacobinte Swargarajyam.